In cold Massachusetts winters, frozen pipes are always a concern. Many people take steps to prevent pipes from freezing, such as buying insulation, putting heaters in basements, and buying foam covers for outdoor or underground water faucets. While most people are aware a frozen pipe can burst, causing a great deal of property damage, they can also cause serious health concerns, such as exposing residents to lead and asbestos in older buildings. According to a recent news feature from Consumer Affairs, while most pipes in your home are heated and safe from freezing, problems can arise when a heater fails or if the pipe is an unheated area in or around your home. 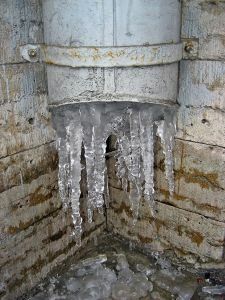 When water inside a pipe freezes, it will expand due to physical properties of water. When it expands, there is nowhere for the water and ice to escape, so it puts increased pressure on the pipe. When the pressure gets too high, the pipe will fail and burst apart. It doesn’t matter if the pipe is made of metal, PVC, or another type of plastic resin. Once a pipe bursts, a stream of water is often released into the building. While typical problems include water damage, mold can grow in this environment, contributing to further property damage. In older homes, where walls and pipe insulation contains asbestos and lead paint, the situation can be dangerous. As our Boston mesothelioma attorneys can explain, asbestos in pipe insulation is one of the most dangerous forms of the deadly substance. This is because it is in a state where it can be easily crumbled. In the industry, this is known as friable asbestos. When asbestos is friable, it can turn to dust, which will flow into your home along with the water. When homeowners go to clean up the damage, they can be exposed to asbestos dust, which can lead to mesothelioma, lung cancer, and other forms of respiratory illness. This is especially true if a vacuum is used during clean up, as vacuums work buy sucking air into the machine and then blowing in back into air after it has gone through the collection chamber. The filters on most consumer vacuums do not provide protection from asbestos fibers, and, even if they did, the user would be exposed to the fibers when changing or cleaning vacuum filters. Another problem is after being exposed to asbestos, there is no way to know if you have inhaled the fibers. They are microscopic in size and doctors have no effective way to diagnosis asbestos exposure at such an early stage in the process. Doctors normally suspect asbestos exposure after a patient has come in complaining of symptoms of mesothelioma and perform a biopsy. Doctors will not generally cut out what could be healthy lung tissue when there is no indication a patient has mesothelioma or asbestos. Once inhaled, the victims must basically wait between 20 and 50 years for symptoms to develop. By the time symptoms develop, the disease is already in an advanced stage, and the patients may be close to dying from the deadly illness.